The primary purpose of the Yongey Buddhist Center is to observe and honor the precepts and principles of Buddhism, and to study Buddhist scripture and teachings. Our organization supports the activities and teachings of the Very Venerable Yongey Mingyur Rinpoche. We hold regular worship services and study sessions. We arrange for the printing of rare Sutra texts and Buddhist teachings, and distribute these texts free of charge to requesting individuals and monasteries. We organize and sponsor guest lecturers and teachers for Buddhist teachings and special empowerments. We encourage philanthropy through the collection of money for the purchase of food, clothing and medicine for local Buddhist monasteries and other organizations needing assistance. A final long-term purpose of our organization is the creation of Buddhist religious monuments (Stupas and Temples) in Northern California for the benefit of mankind and all sentient beings. Through the practice of Dharma, we hope to honor the principles of Buddhism and to help others reach enlightenment. In early 1998, Mrs. Mei Yen Chen Ladle decided, with the support of her husband and close friends, to build an Enlightenment Stupa at their private property in Northern California. It was their desire to direct the merit of this project towards all sentient beings, to further world peace and harmony, and to wish all sentient beings to attain enlightenment. When friends and families learned of the project and its purpose, a great many were eager to help sponsor its construction and to volunteer their services. However, since the planned Enlightenment Stupa would be located on private property in a development with restricted access, public visits to the Stupa would be severely limited if not impossible. Mrs. Mei Yen Chen Ladle appreciated the sincerity of those who wished to partake in building and supporting the enlightenment stupa and she recognized their disappointment in not being able to fully join in the effort. At the urging of many friends and families, Mrs. Ladle decided to form a non-profit organization with a principal goal to build an enlightenment stupa in a public location where everyone could come to pray and circumambulate. With this purpose in mind, the Buddhist Society for Supreme Enlightenment (BSFSE) was founded and incorporated in California on May19, 1998. Under the guidance of Mei Yen and Dwayne Ladle, construction of the first Enlightenment Stupa was finally completed in 2000, and H. E. Tai Situ Rinpoche was invited to consecrate the Stupa. However, H. E. Tai Situ Rinpoche was unable to come, so Mrs. Ladle invited the Very Venerable Yongey Mingyur Rinpoche to perform the consecration. The stupa consecration date was finally set for May 19, 2001. Yongey Mingyur Rinpoche arrived in early May with four lamas and immediately set to prepare for the consecration. Rinpoche personally attended to every detail. His wisdom, thoroughness and responsible attitude impressed everyone working with him. In the summer of 2002, the board of directors of the Buddhist Society for Supreme Enlightenment decided to offer the non-profit organization as a dharma center for Yongey Mingyur Rinpoche. Rinpoche kindly accepted the offering and the organization was renamed Yongey Buddhist Center. Now, in addition to plans for building a public Enlightenment Stupa in Northern California, the Center also supports the teachings and activities of Yongey Mingyur Rinpoche. In August of 2004, the Yongey Buddhist Center was granted CHURCH classification status by the Internal Revenue Service. As a church, the Center became the first active Dharma Center for Mingyur Rinpoche and started holding weekly worship services that continue to this day. Each year, Mingyur Rinpoche returns to his Center to hold open talks, Mahamudra retreats, and empowerment ceremonies. While Rinpoche was on his extended retreat, the Center followed his guidance by holding weekly chanting and meditation services and conducting short retreats on weekends. The Yongey Buddhist Center continues these activities to this day. Please remember this: the precious human body is difficult to obtain; the precious dharma is difficult to encounter; the precious master is difficult to find. It is our sincere hope that every disciple receives much benefit from the guidance and teachings of our very venerable guru, and reaches the path of enlightenment. The Yongey Buddhist Center was organized and incorporated as a non-profit religious corporation on May 19, 1998. Originally named the Buddhist Society for Supreme Enlightenment, the organization name changed in 2002 and became a dharma center for the Very Venerable Yongey Mingyur Rinpoche. The Yongey Buddhist Center organization consists of a board of directors, a president, a secretary and a treasurer. There are currently 10 members on the board of which the president, secretary and treasurer are also members. In addition to the board are over 20 persons directly involved in various committees, fundraising activities and other programs. The Center does not have an organized membership but relies on the assistance of volunteers. Q1. What is the Yongey Buddhist Center and its special relationship with Mingyur Rinpoche? The Yongey Buddhist Center was established as Mingyur Rinpoche’s first dharma center in 2002. The center’s headquarters is in Milpitas, California with branch in Flushing, New York. The Yongey Buddhist Center supports the activities and teachings of the Very Venerable Yongey Mingyur Rinpoche and holds regular worship services and study sessions under the Rinpoche’s guidance. Q2. Where is the Pal Karma Dorje Dzinpa Ling retreat land? 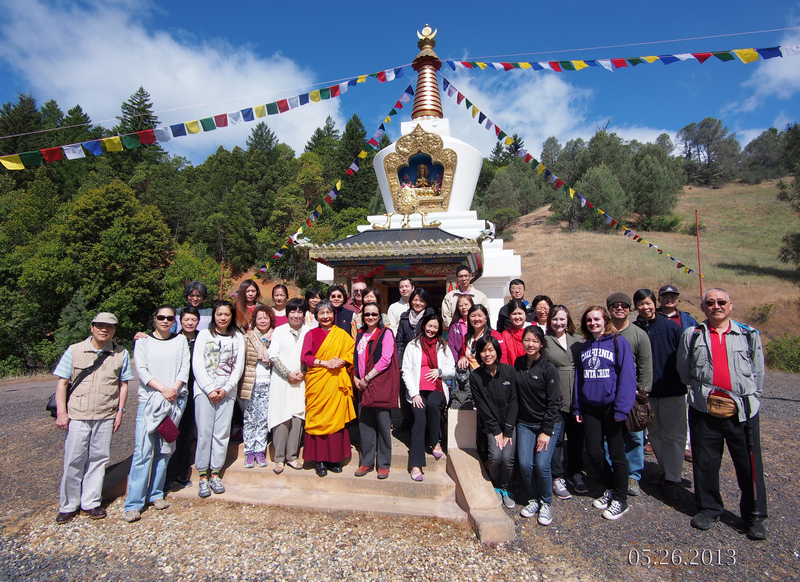 The Pal Karma Dorje Dzinpa Ling retreat land is located in Northern California near the town of Willits in Mendocino County. The private retreat site is on 160 acres of mountain forest land in a secluded scenic location. Q3. How do I upload photos of Rinpoche to this site? Please email photos as an attachment to info@yongey.org. Please include your name and phone number.